Please join us for the League's Fall General Membership Meeting! 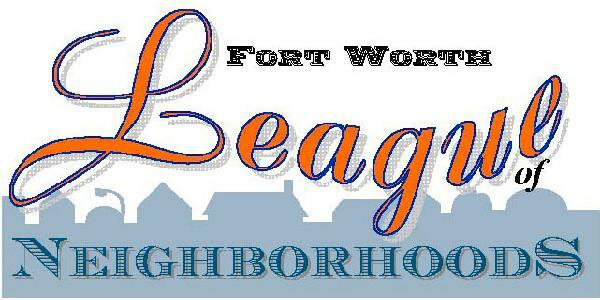 The membership will hear an update on the City of Fort Worth proposed budget for 2013-'14, particularly as it relates to City services to neighborhoods. The 2014 proposed budget projects reductions in police, fire, and Code Compliance positions. This will be the 4th consecutive year that the League has analyzed and reviewed the proposed City budget for its membership. The next public hearing on the budget is Tuesday, September 10. The membership will also hear an update on the City Water Utilities Task Force meetings, which the League has been monitoring as the City considers privatization of some water services. Additionally, the League's membership will hear an update on the City's proposal on amending its ordinances on gas line compressors in Agricultural-zoned areas near neighborhoods. And come prepared to give a brief update on your neighborhood's news!